Kappa is a contemporary typeface created by Salvador Rodriguez together with Diego Aravena Silo and published by W Foundry which comes in two widths (Display & Text) each with 9 weights (from Thin to UltraBlack) and their italics. This sans serif font has humanistic and geometric touch, a wide range of Opentype features and multilingual support. It is legible in small sizes and also can be suitable for advertising, branding, invitation, logo, poster etc. Enjoy! Styles: Display, Text, Thin, ULight, Light, Book, Regular, Bold, XBold, Black, UBlack, Italics. 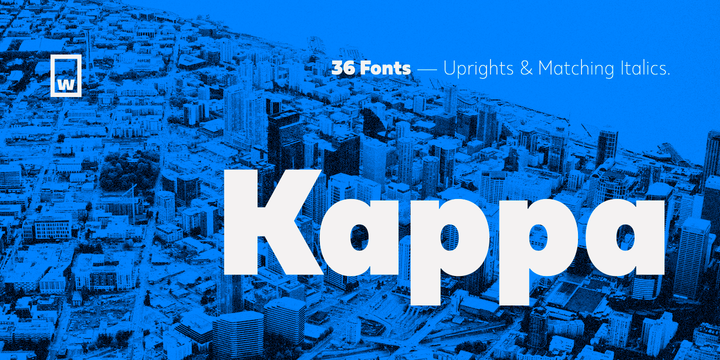 Price: starting from $25 for one font to $299 for all 36 fonts. A font description published on Friday, March 17th, 2017 in Diego Aravena Silo, Fonts, Salvador Rodriguez, W Foundry by Alexandra that has 4,369 views.